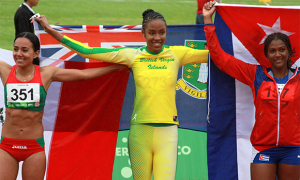 the British Virgin Islands’ Central American and Caribbean Games’ gold medal streak to four straight when she landed at the top of the Long Jump pile in Xalapa, Mexico, during the 22ndedition of the event on Tuesday afternoon. She also became the first in a field event after three medals in the short sprint. Meanwhile, Tahesia Harrigan-Scott who was seeking to become just the second 3-peat 100m women’s champion, finished a disappointing eight in the final after hip troubles. She had a time of 11.93 seconds. She advanced to the final by placing third in her heat on Monday in 11.60 seconds. Prior to Malone’s gold medal, Dion Crabbe won the territory’s first medal in 2002 in the 100m. Harrigan-Scott added 100m titles in 2006 and 2010, giving the BVI four straight gold medals in four straight CAC Games.